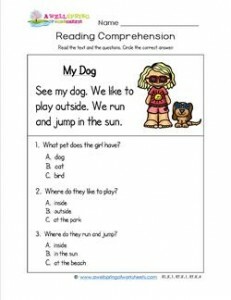 This reading comprehension worksheet features this cool little girl and her cool little dog. They are great companions who get outside to play! Read all about them and answer the three multiple choice questions. There are 3 worksheets included in this set – color, black and white, and an answer sheet. Hope they will all be useful to you! Please go to this page to see all the Kindergarten Reading Comprehension worksheets in this set.